We almost thought the UB Pefas had left for warmer climes when neither bird was in sight yesterday, and the temps had dropped to the 30-40 range, leaving frost on all the Halloween pumpkins this morning. Last year BB and Smoky left town in October, returning in February. 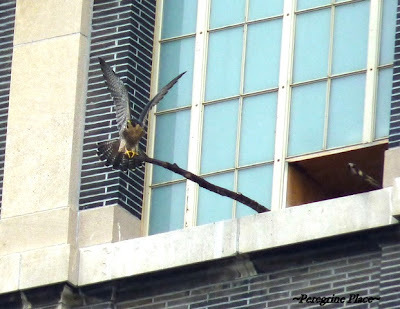 We've been wondering whether they would stay in town this year since they have had their first nesting season, fledging four healthy Peregrines. Today we were rewarded with this beautiful sight!